Imagine a sunny Friday mid-morning and a girl sitting on the top deck of the 142 Magic Bus, chuffed with the retail therapy she had just treated herself to and listening to Paolo’s “New Shoes” on the way to the library. She looks out the window… spots a big billboard with 7 men, all of extreme shapes and sizes, dressed in items from HIGH and MIGHTY. She looks down, looks back up at the next billboard… and BOOM. By now you probably realise that this impulsive girl was me – this morning – in central Manchester. This picture was the second billboard – twice the size of the first and twice as eye-catching. Needless to say, I have ridiculous amounts of respect for each and every man here. They remind me of the women in the Dove campaign a couple of years ago – all in their underwear, showing what a real woman looks like. The campaign itself (have a read by clicking the link) is so important too, as specialist clothing stores sometimes hold a stigma which I believe makes absolutely no sense in today’s world. I absolutely love this ad, and no, not just because of the guy on the far right (although he does help the cause!). Wellesley College Scream Tunnel ’12 in support of Boston’s Marathon Monday: In respect for those affected for the Boston Bombings 15/04/2013. Never before have I woken up so early on a public holiday however, it is tradition for Wellesley Women support the athletes of the Boston Marathon. As the half way point, Wellesley have acted as a support system for runners since the 1970’s, providing drinks, hi-fives and more recently, a cheeky kiss. 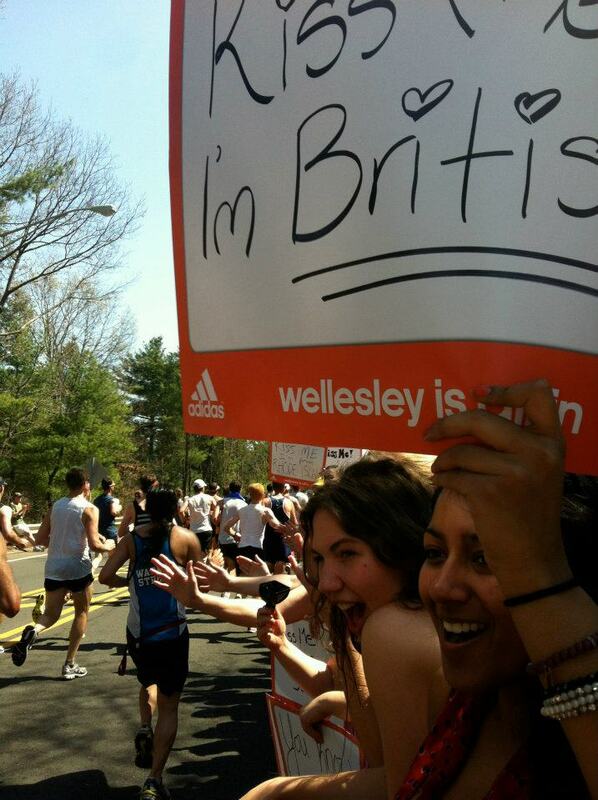 I never really understood marathons until I took part in the Wellesley Scream tunnel during my semester there. The determination and endurance of the athletes really blew me away and since then I have an up most respect for those who run, walk and wheel their way to the finish line. The atmosphere the event fostered around the Boston area was so infectious and you couldn’t help but feel the sense of community. Unfortunately, it did not occur to me that holding up a “Kiss Me, I’m British” sign would mean getting my cheek covered in other people’s sweat. Clever, I know. Yesterday, the inspirational event that is Marathon Monday was in full force again. However, 2 devices exploded near the finishing line in Downtown Boston killing 3 people and injuring many others. Limbs severed, lives ruined and faith, broken. I chose this “flashback” picture for my image of the week in honour of those affected by the bombings. It represents the spirit of the Boston area and also how events like this can bring the whole world together through sport. The bombings were directly targeting these representations (as well as innocent people) however I hope the spirit of the event will not be killed. 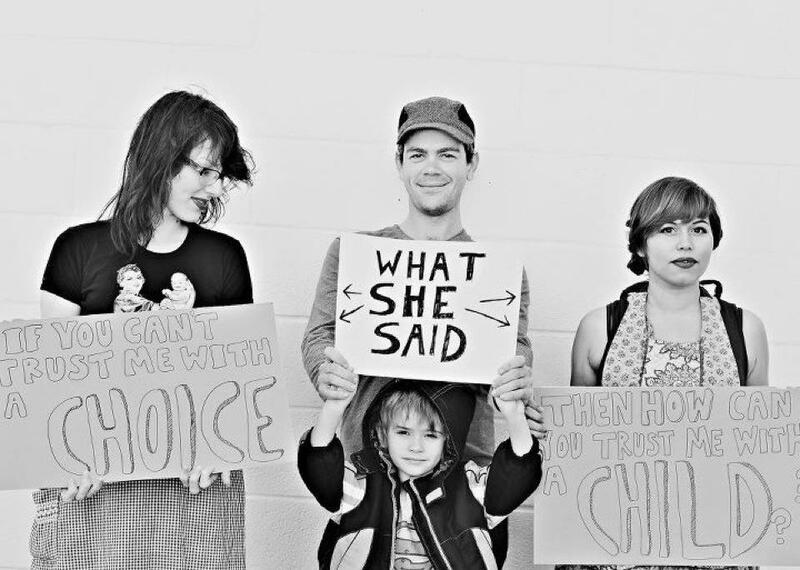 If you can’t trust me with a choice, how can you trust me with a child? Also on that note, using the terms “pro-life” and “pro-choice” surely has pre-implied connotations about negative and positive, such that “pro-life” sounds like the “positive” phrase and therefore giving that argument a bias? Just a general point on language in debate. p.s. Still can’t find who originally said this/whose campaign included this so information would be much appreciated!